A leaflet about the library and proposed events in Brockwell Park has been produced and distributed by some local residents and library supporters. Staff from the gym operator, GLL, will supervise the library. The library will not be effectively supervised except when library staff are present. We are told this will be about two hours a day. The library will be open when library staff are not present. This is only a temporary arrangement which we expect to end two months after the Council Elections. Carnegie Community Trust has three active members. There were five members, that is, trustees and there does not appear to have been any change of substance. The two members who are most obviously Labour activists connected to Lambeth have resigned as trustees but continue as volunteers. There is no evidence that the gym will make a profit or contribute funding to the library. All the evidence indicates that the gym will always need subsidising. GLL will not pay rent until 2023 There are no grounds for expecting the gym to last until 2023. 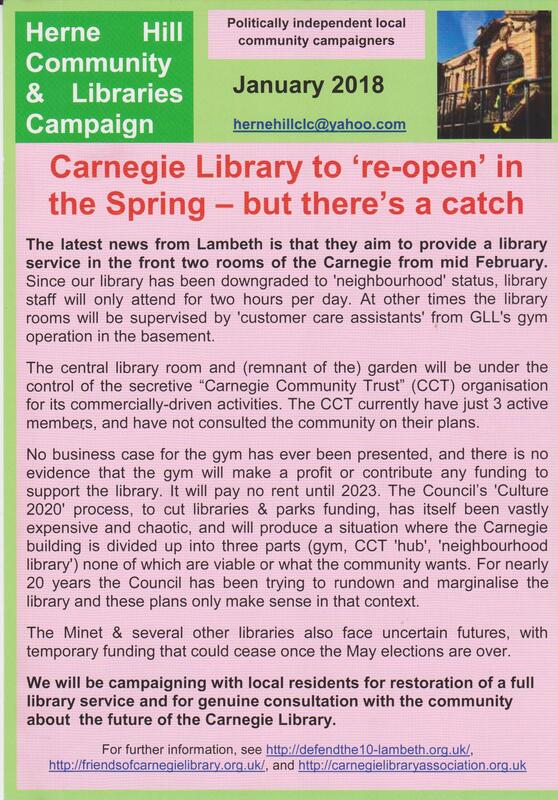 We sent a summary of the arrangements for Carnegie Library to Cllr Sonia Winifred, who is Lambeth's Cabinet Member responsible for libraries, and copied in the senior Herne Hill councillor, Jim Dickson. We asked her to come back to us if anything in it needed correction. A month has elapsed without any response and we therefore infer that the summary is accurate in all respects. A copy is here.